Much of the following information has been gleaned from a thesis by George David Inglesant carried out circa 1980. 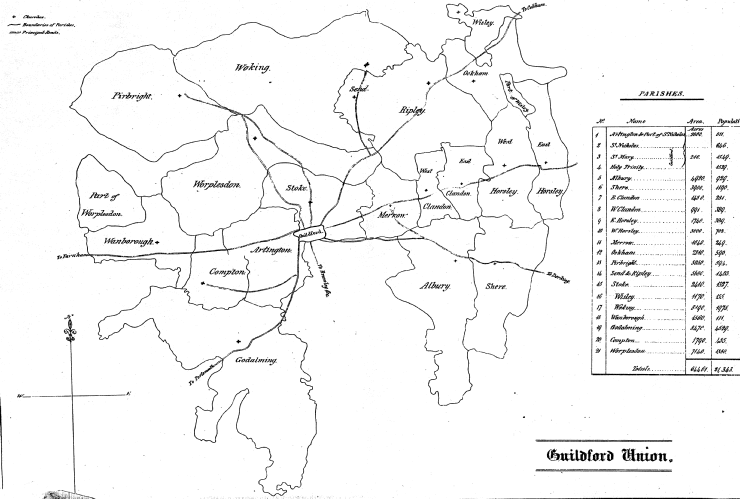 Under the parish based system first introduced in 1601, there existed poorhouses at Godalming , Send & Ripley, Worplesdon, Albury, Merrow, Ockham, Guildford, Woking, Compton, East Clandon, Stoke, Shere and Wisley. The Guildford workhouse was in North Street and looked after the poor from the parishes of Holy Trinity, St Mary’s and St Nicholas, it could accommodate 50 paupers and on average there were about 25 housed there. The cost of running so many small poorhouses or workhouses was one of the reasons why the Poor Law Commission, based at Somerset House in London, had come up with the idea of large Union Workhouses which would be cheaper to run through economies of scale. Guildford Poor Law Union was formed as part of the Poor Law Amendment Act introduced on 14th August 1834, it covered an area approximately 12 sq. miles, and initially cared for the poor of 21 parishes which at that time had a population of 21,343. The Board of Guardians of the new Guildford Union were elected on 11th April 1836 and met for the first time the following week, they adopted Abbotts Hospital as the location for their future weekly (later twice weekly) meetings. At Union level decisions were made by the Board of Guardians who were mostly “elected” land owning gentry. To qualify for election one had to live in a property that attracted a rateable value of at least £20 p.a. The Guardians initially sub-divided the Union into three key divisions; Guildford, Godalming and Woking, each had its own paid officials and the most important of these was the Relieving Officer. For it was he who would decide what relief, if any, should be given to anyone asking for support. A fundamental part (rule 4) of the New Poor Laws was that out relief should no longer be given to the able bodied poor, it was the workhouse or nothing! This greatly discouraged people from claiming relief in the first place. The parishes were responsible for the cost of running the union workhouses but the new system saw an overall dramatic fall in the cost of keeping the poor. In the early 1830s the cost of keeping the poor in the Guildford Union was in the region of £22,000 per year, by 1845, this had reduced £10,066 for that year. None of the three workhouses that the Guardians retained were in particularly good repair or very well run. The worst, and biggest, of these was Godalming, it was only just under control and discipline was poor which resulted in the master and matron (Mr. & Mrs. Cripps) being replaced by Thomas and Elizabeth Aimes. 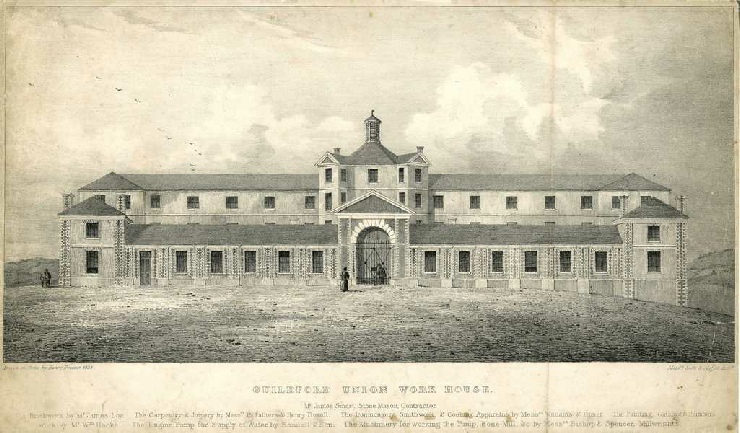 The problems at Godalming together with other issues on the maintenance costs of the old buildings meant that a decision was made to construct a new clean and well-disciplined central workhouse. Godalming workhouse was by far the largest of the three (260 inmates) but only minor consideration was given to improving and adopting it as the central workhouse for the Union. 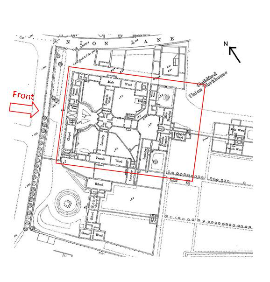 A lack of vacant land for expansion was given as the reason for this rejection but in fact it is far more likely to have been due to the antagonism between the two towns, some of which survives to this day! After much debate between the Guardians and Poor Law Commission plans were accepted from Scott and Moffatt for the construction of a new 300 place workhouse at Worplesdon. In the end however 6 acres of land owned by William Haydon just outside Guildford was chosen although it was necessary to negotiate the price down from £400 per acre to £150 per acre! To give some idea of what was needed to build a workhouse of this size a tender was won for the supply of 300,000 bricks (at £2 per 1,000) and 11,000 loads of bargate stone at 6 shillings & 9 pence per load. The heating system decided on was a warm air system costing £210. A pump for the water supply was ordered at a cost of £250 and just over £68 was spent on cooking apparatus. Most of the work was carried out by able bodied paupers who could lay a brick or make a door, still capable of work but were possibly no longer able to journey to find work around the country due to injury or arthritis etc. Work had started on the new workhouse in April 1837 and it seems incredible today that such a large building was completed in just 15 months at a cost of £6,000. The workhouse site in 1868. Boxed in red is the original building of 1838. Surrey Archaeological Society, Bulletin 337, April 2000.